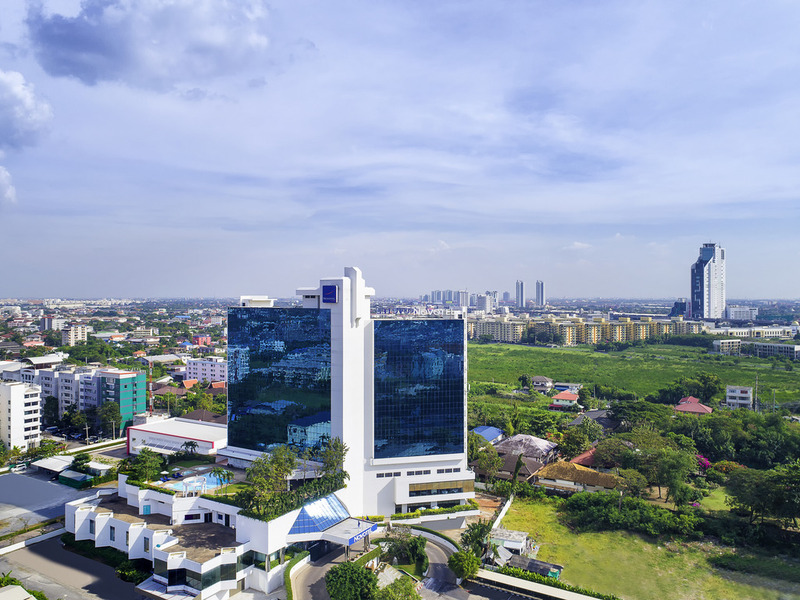 The 4-star Novotel Bangkok Bangna hotel is located in the fast-growing Bangkok Bangna area. Enjoy live music and refreshments in Puangmalai Lobby Lounge or dine in our restaurants which offer various types of cuisine. Relax, keep fit and unwind with our complimentary wellness and sports facilities at Novotel. Perfectly suited for business or family trips. Hop on the free shuttle bus provided by Novotel Bangkok Bangna to BITEC Exhibition centre or take the BTS Skytrain for easy access to the city centre and world-class shopping malls. Located in the heart of Southeast Asia, Bangkok is a modern and lively city with a variety of attractions to offer. The bustling city is filled with magnificent palaces, diverse cuisine from world-class restaurants to street stalls and shopping malls. Conveniently locaed on the first floor, ths international offers sumptuous buffets for brerakfast, lunch and dinner, an a la carte menu featuring international and local cuisine is also available on request. Experience traditional Szechwan and Cantonese cuisines from our master Chinese chefs at the Shui Xin Chinese Restaurant. Professional Chinese chef who has a real passion in cooking the best Chinese dishes for everyone! Located off the lobby, the Deli Shop provides freshly baked breads, mouth-watering pastries, sumptuous sandwiches and homemade pralines. Take away or relax and unwind with freshly brewed beverages and snacks in the comfort of the lobby. Experience traditional Szechwan and Cantonese cuisines from our master Chinese chefs at the Shui Xin Chinese Restaurant. Professional Chinese chef who has a real passion for cooking the best Chinese dishes for everyone! The unique feature of open kitchen concept between chefs and diners. The kitchen also features a pizza corner which is favorite among children and teenagers. Unwind and relax in the the hotel's lounge with your favourite food and beverages. Live music is available. The Bar offers refreshments, finger food and light snacks daily. It is also the ideal place for casual business meetings and rendezvous. We were staying for a long period of time. The room is dark, wet and stinky. The only clean part of it is bathroom. Windows are dark, no sun comes inside, they don’t open, and the a/c hasn’t been cleaned forever. There’s no air to breathe. The carpet is dirty with obvious stains on it. All furniture is very old. The staff is very friendly but not always helpful. Only few people really understand English. The kitchen is ok, but it seems to me people in Thailand don’t get how the dish can be without garlic or spices... The hotel doesn’t have any territory, just a swimming pool with a few trees on balcony. The reception staff took 4500 baht from me for the room which I didn't owe they told us this on check out and not check in, you need to audit the reception staff as I think there stealing guests money. Everything is good but the door of room and door of bathroom, hard to open it. Staff are nice and friendly. Having driven passed this hotel countless times, we finally had an unexpected opportunity to stay ahead of a trip back to UK. Special thanks to Khun Joey who went out of his way to assist us with a number of questions and requrements at very short notice. Check-in was smooth. Had pre-dinner drinks in the bar before the buffet in the evening and both were excellent. No complaints whatsoever and we shall be back. Thank you. The staff are friendly, helpful and polite., especially the concierge. The rooms are on the smallish side but comfortable clean and quite well equipped. Very good value for money. My stay was as expected as I am a regular visitor to this Hotel. The Staff at the Bar ( K.Natt / K.Sal, Gladys and K.Beer) all looked after me well. I think the pool area need to be looked at as now some of the sunbeds are broken, All of the umbrella's are broken and the whole area is now looking a little untidy. I like to spend time in the sun at the weekends so I do use this area. Maybe it is time to change the sunbed mattresses as ants live in some of them and when you use the bed you get bitten by the ants. Maybe even just change the current sunbeds for the white plastic ones currently used at many beach resorts. As title, some of the facilities need to be upgraded. But the overall living environment ok. I personally would not change anything like I said above you have excellent staff and the food was great, If I could make one suggestion for you breakfast menu milk should be a jug and not in little cardboard boxes, which makes a mess. No executive lounge. Limited breakfast. Room is good! Good design! Thanks for Miss PUI at reception, very warm suggestion and very fast feedback! The place is so nice for me and my family. Every staffs take care of us very well. Only one thing that we still never tried is the restaurant there. We will try next time fore sure. Good hotel and staff. Perfect for overnights for early morning flights.